Remove Amulet of Quoz from your deck before playing if you're not playing for ante. 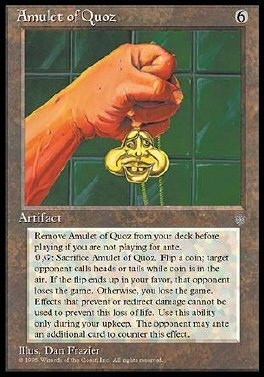 T, Sacrifice Amulet of Quoz: Target opponent may add the top card of his or her library to the ante. If he or she doesn't, you flip a coin. If you win the flip, that player loses the game. If you lose the flip, you lose the game. Play this ability only during your upkeep.